The Water Accelerator is located at 3rd St. & W. Pittsburgh Ave., but won’t be for long as the street is being renamed. Photo by Dave Reid. Freshwater, it seems, is fresh out of luck. 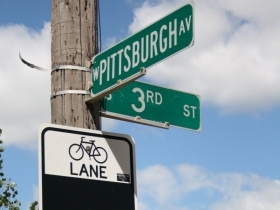 The winning choice of the City of Milwaukee’s contest to rename Pittsburgh Avenue in October 2012 was Freshwater Way. The idea behind the contest was that the new Water Accelerator building at 223 W. Pittsburgh Ave. should not be burdened by a name that calls to mind a different city. (The street was actually named after a paint company.) And so both East and West Pittsburgh Avenues would become East and West Freshwater Way. The mayor initiated this competition which received 650 entries, 7 of which came up with Freshwater. The selection was made by a panel that included Ald. Jose Perez, Peter Moede the owner of the Reed Street Yards, (which is envisioned as a Water-themed business park), various city staffers and John Gurda, the Chairman of the City Advisory Committee on the Naming of Public Buildings, Facilities and Streets. An unspecified number of entries suggested keeping the Pittsburgh name, “although a lot of those were out-of-state entries from people in Pennsylvania,” a mayoral press release announced. Seems like the Quaker Staters aren’t the only ones who want to keep the Pittsburgh name. As required by law, the City must send a postcard to businesses, property owners and residents in order to effect an official street name change. “The street name proposal shall not be given further consideration” if it has less than 50% support of those entities. So, the city sent out 112 postcards to Pittsburgh Avenue addresses, and guess what? Only 10.7 per cent of the respondents were in favor of the name change for the four-block long street. This brought Public Works Commissioner Ghassan Korban and City Engineer Jeff Polenske into the picture. It occurred to them that the Freshwater Way name might only apply to the one block between S. 2nd and S. 3rd streets, where the water institute is to occupy the building now known as 223 W. Pittsburgh Ave. The city could also go the “honorary street name” route, which is rarely used here, but quite common in New York City. In that case, a “Freshwater Way” sign would be attached to the regular street sign. This has its own set of rules and procedures. The Public Works Committee approved the amended proposal for the one-block Freshwater Way yesterday, June 19th, and passed it on to the full council for its consideration. Sheila M. Pufahl-Bellin has applied for a Class B Fermented Malt Beverage and a Class C Wine Retail license for Brewed Cafe at 1208 E. Brady St., joining the other caffeinated joints in the area like Rochambo and Comet Cafe that offer alcoholic beverages. … Casablanca Restaurant’s recent significant expansion at 1208 E. Brady St. is not without a few growing pains. Owner Ala Musa petitioned to extend its food service hours to 2 a.m., seven days a week, but this ran into opposition from neighbors who testified that since the expansion there have been problems with noise, intoxicated people, etc. outside the restaurant. It is one of the few places in the city that does three turns a day. It has an excellent lunch buffet, a solid dinner business, with a significant family presence, and then it becomes a night club, right down to the belly dancers. Ald. Nik Kovac suggested the change of hours should be held for now, and that a warning letter should be entered on the restaurant’s file. … You have only until June 30th to indulge your culinary fantasies at Shubh Mobil gas station, 714 N. 27th St. That’s because the licenses committee decided not to renew this establishment’s permit to sell its diverse array of packaged foodstuffs. (The sort of junk that drives convenience store profits.) The neighborhood association, the police and residents gave committee members an earful about the business, long the nemesis of Ald. Bob Bauman. There was testimony about “litter, loitering, roaches, prostitutes, drug dealing and panhandling” at the location, which the alderman called a “radioactive site of nuisance.” … Crisp Pizza, which also had a shaky existence, is closed at 1329 E. Brady Street. David Price and Christopher Tinker, two Brits who came here for soccer and stayed for business, plan to take the place over. They own Three Lions in Shorewood. … Mequon doesn’t make it into the New York Times wedding announcements very often, but the paper of record printed a lovely piece about Jessica Lopez and Lauren Hare of New York who got married by a female Episcopal priest recently at Smith College, no less. Ms. Hare, who will now go by the name of Lauren Lopez, is the daughter of Karla Pinson Hare of Ozaukee County’s largest and most populous city. … Goal Getters, Inc., a Countryside Illinois company that helps newspapers build their circulations and increase and retain their customer base, is suing Journal Communications in a contract case. Judge Kevin Martens will do the honors. How fresh is cryptosporidium? Is it as fresh as the sewage they dump into the river? Frank, since the talk of changing the name of a street, for 1 block, got you so worked up… maybe your delicate self should take a baby aspirin and lie down on the davenport. Warm milk should help too but that might be a bit spicy for you, I’m not sure you’re up to it. The JS had reported that the owner(s) of the Milwaukee Brat House on Third Street were poised to take over Crisp. I assume they had that wrong? I know the Three Lion guys have been looking to expand, so this makes sense. There is a pending application from Brat House / Three Lions to purchase the building and business. It will reopen as Jack’s American Pub. They will remodel it to look more like a Milwaukee tavern and less like a godawful strip mall club. Also, Mike Lee bought the Bruno building, and Josh Malone, manager of Nomad plans to run a bar there. I don’t own a davenport, nor do I have baby aspirin, nor do I have any milk. But I will take your word for it that your “remedy” works. Just trying to look out for you Frank, you seemed to be off kilter & in distress. Off kilter and in distress? Only when I read articles involving Barrett and Milwaukee politics. Indulge me a little bit, for the first half of the 00’s I was a college student here, and then resided in AZ for work for 4 prior to moving back. Through the cities return to having positive population growth (small, but still, the downtown is way different from 20 years ago), growing campus, an improving skyline, etc. what are some of your issues with Barrett besides the train? Good grief. Could the public works department and city government find anything less trivial to be wasting their time and $200 on. Who would have thought that residents wouldn’t want to have to change all their addresses on labels, checks, mailboxes, and just about everything else that relates to their property. Duh! It is all in the timing, perhaps. There are 110 apartments at Bridgeview at South Waterworks. These units are only a couple of years old. So if Barrett had come up with his idea earlier, before there were residents to vote against it, he might have had his way! And this week’s NY Times noted a wedding in Shorewood at the Northshore Presbyterian Church!! One NOT officiated by their long time but now retired and beloved minster Rev. James Bender! !